Long article but every bit interesting. This is what Swami RAMDEV is fighting against! World's #9 Most Powerful Person Now Accused of Corruption -- Will She Fall? keeping their lawyers on speed-dial. party they had given their lives to." 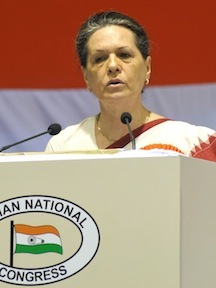 Minister, she ended up as President of the powerful Congress Party. husband was alive, she would walk behind him. In public she wears saris. after Rajiv Gandhi became Prime Minister in 1984.
politicians, social inequity and institutionalized discrimination. <http://en.wikipedia.org/wiki/Bofors_scandal> to the government of India. Quattrocchi, has received kickbacks in the millions. certainly known now. A part of the payoffs definitely went to Quattrocchi. [...] the papers all pointed to the Gandhi family. party lost power to Sonia's Congress in 2004. #18, the Prime Minister of India. proclivity towards facilitating corruption cases. wave, it will be a sea change. should be following very closely indeed.